Palánkos is our favourite. Lying close by, this site is the most difficult. The most different one. As if… as if it was sparkling like life giving fragrant wines with minerality and firm acidity… Kakasok is still being interrogated – and it sort of responds but its potential remains merely proximate – to come close to it is just difficult enough. Kerektölgyes [meaning Round Oak Grove] produces round wines and in a very reliable manner. Diókút, near here in Bénye, is meant to be organic. And we look forward to the new ones – the northerly Hosszúhegy, and Lapis, Gyertyános and Omlás, all tended by our friends or helpers, so that we interpret them too into wine. 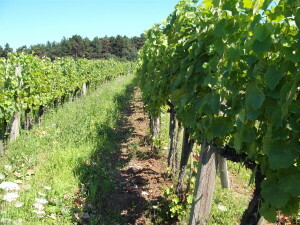 Yields per vine are determined partly by the strength of each vine, partly by the vintage and partly by ourselves – always keeping a close eye on and living together with the vines. Situated in the heart of the Tokaj Wine Region, the Zemplén Mountains and the whole world, our cellar in Erdőbénye is a real working cellar, with just wines, barrels and bottles in’t, its pure function being to convert the juice of the grape into wine – through the careful use of traditional types of new Gönci barrels for Aszú. And this same cellar is used for bottle aging, too. is housed in an old stone building, now under renovation. Heating is already available, cooling will soon be. It accommodates oak barrels for maturing wines as well as steel tanks. This is from where finished and bottled wines are transferred to the ‘deep cellar‘ for storage and aging. A cool retreat in the summer, the arbour is the perfect place to taste wines cold and for us to enjoy the fruit of our labour to the best. In the wintertime, the same function is provided by a shabby room of the small traditional peasant’s house (currently undergoing renovation) on the ‘estate’. A small cellar, lots of manual work and many wine lots of just a few hundred bottles. From pruning to bottling, everything is done by us and for us. And for our friends. Colourful harvests, changing vintages and different ways of maturing – it’s all there for us to taste. Experiments. Connections. Playing within the limits of the terroir. The wines are made for friends – or friends-to-be. So far so little. Fun harvest experience for friends, families or even as part of corporate team building activities – with all tasks organised from picking, crushing and pressing grapes to hydrometering and tasting the fresh juice. Winemaking fully explicated and demonstrated in detail. Starting from the grapes. Vineyard walks to some or all of our sites – as it comes. Learn about the terroir while savouring good food and tasting happy or gloomy wines from the same place, with an optional picnic lunch with us out in the vineyard.